We were absolutely thrilled to be asked to do this winter wedding shoot for the latest, Fall / Winter 2013 edition of Luxe by Calgary Bride magazine (available on newstands now). We designed a summer tablescape and a winter tablescape for the issue. You can see our post on our summer inspiration here (Part 1) and here (Part 2). We collaborated with the amazing husband and wife team, Matt and Trish from f8 Photography and the very talented Rebecca Bruhjell owner and designer at Rebecca Dawn Flower Design for both shoots! Trish captured all the beautiful images! For the our eco-chic, winter shoot at Earl Grey Golf Club we wanted to keep things somewhat simple and minimalistic, but with luxurious touches like the gorgeous flowers from Rebecca (I am a huge fan of her work!!). At Naturally Chic, we love working with reclaimed woods and natural textures. Having a mix of various textures such as wood and burlap is perfect for an elegant, yet rustic setting, and adds warmth to winter decor! I love Rebecca’s use of textures, such as; artichokes, evergreen branches and cotton mixed with soft lamb’s ear, roses and hydrangea. I have always loved weddings that have useful (read edible 🙂 favors. 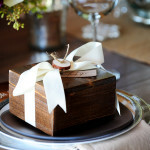 I love the idea of food favors which are rarely left behind, like our dark chocolate dipped figs in our hand-crafted wooden boxes which guests can re-purpose to hold small treasures or trinkets afterwards. We engraved wood tags and made wood buttons from small pieces of found branches. We used a burlap runner and our table number is made from reclaimed walnut. For our menu, we engraved wood veneer and placed in a vintage frame. The beautiful ‘winter’ centerpieces by Rebecca Dawn Flower Design were arranged in mercury glass vases. We made walnut wood placecards from engraved pieces of walnut leftover from other projects. We made wood “mr.” and “mrs.” signs for the bride and groom’s chairs from reclaimed construction lumber. The beautiful cake was made by Cake Works in Calgary, Alberta. To complete the look we decorated the mantle with pinecones, candles and birch wood. Hand-painted wood Stationery by Naturally Chic (including reclaimed wood place cards, table numbers, menu, birch cake stand and all the wood signs). And a shout out to Don from Naturally Chic and the lovely Melanie from Blackbird Events for helping me set up! Custom engraved maple, cherry and birch wood table numbers with mountain and rustic design by Naturally Chic. Engraved wood, ski themed table marker by Naturally Chic. Wood wildlife table marker by Naturally Chic. Naturally Chic Designs is a division of Naturally Chic Wedding and Event Design. We create custom decor items using eco-friendly materials whenever possible. Our main medium is wood. We use reclaimed wood, naturally fallen wood, construction extras and eco-friendly paint and finishes. As part our creative process at Naturally Chic Wedding and Event Design is to create custom designs for our wedding and event clients. One of our goals is to provide signature decor items that reflect the couples’ theme, personality and style! There is virtually no limits to the items we can create for our clients from unique altars, rustic wedding arches, to table decor and photo booth props. We service Banff, Canmore, Lake Louise, Jasper, Emerald Lake and area! We would love to work with you on your wedding by creating decor as unique as you! In addition to our custom decor, we provide Naturally Chic design rentals on decor we already have for our wedding clients. We have customers from all over the world purchase our natural products: wine boxes, table numbers, custom wedding maps, wood wedding stationery etc. (as long as the items aren’t too big for shipping). We are constantly adding new items and coming up with new and unique designs, so we have added a category to our blog just for Naturally Chic Design items! If you have suggestions for unique decor items or a question about any of the products we can provide, send us an email at hello@naturallychic.ca or visit Naturally Chic . Contact Naturally Chic and Naturally Chic Designs for more information on wedding and event decor rentals, custom design or assistance planning your wedding, at 1.888.679.9056, or email us at hello@naturallychic.ca .